Although my degrees have been in Philosophy, Aesthetics and (latterly) in Environmental Science, I have written poetry all my life. I have been fortunate in being published widely, and I give frequent readings all over Britain and abroad. Two of my collections were published by Oversteps Books, and I subsequently took over as Managing Editor when the founder, Anne Born, became ill. I am therefore now able to give practical help and encouragement to some of the best contemporary poets who are seeking publication. Further details about my publications can be found here and about Oversteps Books here. It is not unusual for poetry collections to develop themes organically as a critical mass of poems is found to fit together in some way. For instance, my last three collections have been based on an environmental theme, a winter and Christmas theme, and then a collection about life in a camper van. More recently, I have found that a substantial number of my poems have featured women through the ages. These have included women from mythology, from the Bible, from history and from folklore as well as some notable contemporary women, and these poems will form my next collection. Several of them, such as Chiara and Cleopatra, shine a new light on an historical figure; some, such as Menses and Rendezvous reflect on specifically female experiences; figures from literature include Jane Austen and Alice in Wonderland; biblical figures are represented by Lot’s wife and Salome; and some respond to relationships with friends, mothers or daughters. A number of them have already been published in magazines or anthologies, and one of them, RP RIP, about Rosa Parks, won the 2015 Leeds Peace Poetry Prize. I have also been interested for many years in a number of mediaeval women, and as well as writing occasional articles and giving talks on some of them, I have sometimes focused on them in my poetry, including Hildegard, Julian, Godiva and Heloïse. It is intended that some of these other poems may feature in future blogs of the Women’s Literary Culture and the Mediaeval Canon website. Despite my long-standing interest, I was nevertheless a little surprised when this extended poem about St Clare more or less wrote itself recently. I had not thought about St Clare for a number of years, and was left wondering where the poem came from. 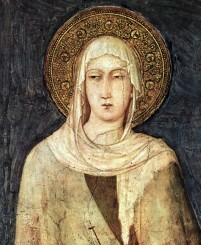 I suspect that the answer lies in the fact that when I visited Assisi, many years ago, I found myself feeling rather sorry for Clare (1194-1253). Those who have been to Assisi will know the story of her devotion to St Francis and the fact that when he embraced the monastic life he persuaded her to become a nun. She undertook numerous good works, and in time became the founder of the Order of Poor Clares. While in no way wishing to diminish her genuine piety and spirituality, I could not help feeling that ending up in a convent might not have been quite what she had in mind when she was attracted to Francis and followed him. There were, of course, advantages to the monastic life for women at this stage of history, providing the possibility of independence and an education that they would have been unlikely to enjoy otherwise. But I was also aware that Clare shared all the passion, enthusiasm and confusion of other teenagers — and that she loved Francis deeply. It would appear that this sympathy of mine for Clare, and divergence from the normal hagiography, had lain dormant until this past Autumn, when it erupted in this poem. to the love of Gd. and the unity of all that is. greedy to share his joy and suffering. as much as any boy or man. that it was not sin. we get the message wrong. there’d be no room for me. What news of war, Beloved? There were so many dead. in the field of blood. him to a better place. by his fine brocade and silk. to catch an unwary boy. in a place I can’t define. before he turned and walked away. in secret in my heart. I will feel the fires of hell for it. a feral creature, never to be tamed. the freedom of the eagle. it was my choice, or so I thought. What can I offer now? on the only one I ever loved? to meditate on all that follows. and take me for a saint. that I kiss each day. the maidenly confusion of my heart. the gift and curse of love. be allowed to hold my treasure? will my love be undiminished? on the long journey home?